Which tea is fit for a king? 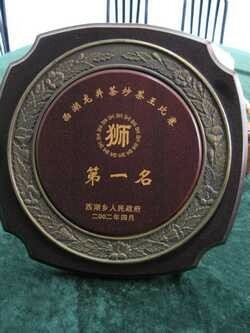 Tribute Dragon Well tea is the only tea in the world that the Chinese White House consumes in large quantities. Naturally organic, now you can enjoy the 2009 harvest directly from a tea garden. In the old days, emperors drank tribute teas. For thousands of years, hundreds of these teas existed. Most perished and were forgotten. Today, only one survives: the Tribute Dragon Well tea. Every year, the Chinese White House - Zhongnanhai (Central South Sea), or the modern Forbidden City, acquires 500 kilograms of this tea. The growers sell the surplus after meeting the quota. She is also known as the Queen of Chinese tea. 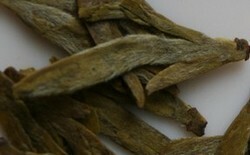 Dragon Well tea is now cultivated in 14 provinces throughout China. The only authentic source is the Zhejiang Province. Zhejiang produces 15,000 tonnes each year. 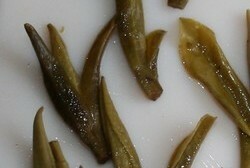 Its most renowned variety comes from West Lake. West Lake is the Champagne region of Chinese tea. It accounts for just 6% of Zhejiang's production. There are more than 30 West Lake sub-varieties. 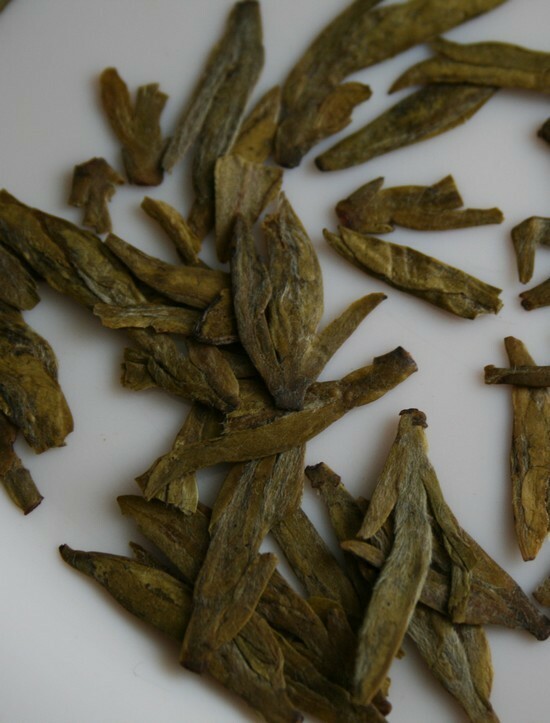 The No 1 sub-variety is grown in the Lion Peak Mountain (Shifeng). Only the best tea gardens here bear the Tribute seal. Their teas go directly to the Chinese President: Mr Hu Jintao. Harvesting takes place once a year in spring over 6 weeks. The tea plants are rested for the remainder of the year to preserve its quality. Fancy the life of a tea grower? The highest grade is picked in the first 2 days. They yield the fattest and sweetest tea buds. Taste = quality = nutrients. 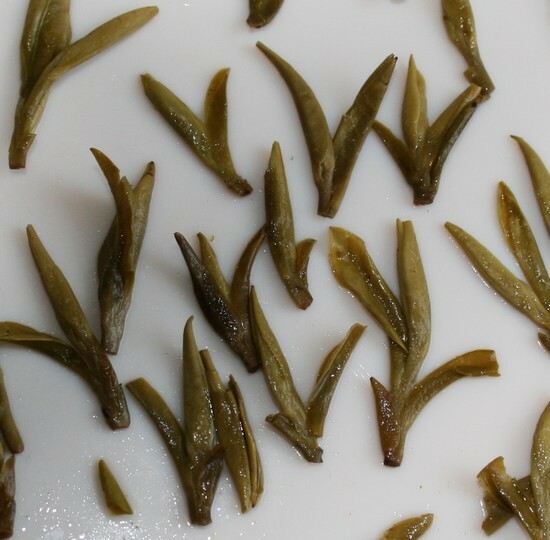 EGCG and theanine exist in the highest concentration in these young tea buds. UK scientists found that it contains high level of quality markers such as theanine, EGCG and other active compounds. HQ's Tribute Dragon Well tea grows at the top of Lion Peak Mountain at an altitude of 700 to 800 meters, well away from road traffic. This is a Grade 1 National Designated Protected Zone. The remote locations and protected status make the foggy mountain an area where endangered plants and animals thrive undisturbed by industrialization and pollution. 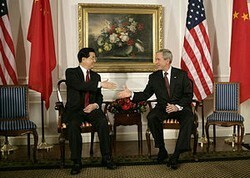 The Chinese White House lays down strict farming rules. No fertilizers and pesticides are allowed. Chemical tests are conducted regularly to ensure compliance. The high grades are harvested so early in the spring that insects haven't started multiplying. The tea buds are so young that they contain little, if any, environmental contaminants. The crops are harvested early when little insects exist. You are drinking the same cup of tea as the Chinese President. Here, the tea is grown in the oldest part of West Lake. The four villages of Weng, Long, Man and Yang are renown locally for producing the best West Lake Dragonwell tea (Xihu Longjing). HQ's Dragonwell tea is grown in the Weng village, right at the top of the Lion Peak Mountain. Today, everything is still handpicked and handroasted the traditional way. It takes a good picker 10 hours to pick 2 kilograms of fresh leaves, which is then made into 500 grams of dried tea. Dragon Well tea-making is an art form that ranks among the most sophisticated. A novice takes 3 years to master the complex "10 hands movements" and they roast not more than 1 kilogram a day. The tradition is still well and alive. HQ's uncle, who owns a neighboring tea garden, was crowned in April 2002 as the Tea King, because of his mastery of the "10 hands movements". The family roasts their teas together - so you can be assured of artisan quality of the Tribute Dragon Well tea.